*With the Em8er Merchandise Store closing, I'll need to figure out a different reward. So how does one earn this currency? Pay attention to me. (Narcissism Alert). I've posted trivia, puzzles, and mindless tasks I didn't want to perform on the Discord channel to reward ultra-fans. I'm also going to move some of that here to the forums. A lot of it will be Em-8er related, some will just be stuff that I find interesting. But there's enough to go around. Just keep playing and you'll win eventually. DOESN'T LOOK LIKE A RABBIT TO ME. BUT DEFINITELY SOMETHING THAT SHOULD STAY EXTINCT. Odd the link is correct and works when i go directly to it but posting it, breaks the link somehow. Well how about this one. Ah well ... I'm too late. I'm pretty sure you are correct Pandagnome. Not sure what you are looking for here? Hmm ... I thought it was the image we needed to identify. Now I think it's the symbol [̅]. Greek: it's a Digamma oblique ... which is the ancient ancestor of the Latin letter F.
"The symbol [̅] has been called by a variety of different names, referring either to its alphabetic or its numeral function or both." "Wau (variously rendered as vau, waw or similarly in English) is the original name of the alphabetic letter for /w/ in ancient Greek. It is often cited in its reconstructed acrophonic spelling "ϝαῦ"." Er I think the symbol is meant to indicate FillmoreBucks? 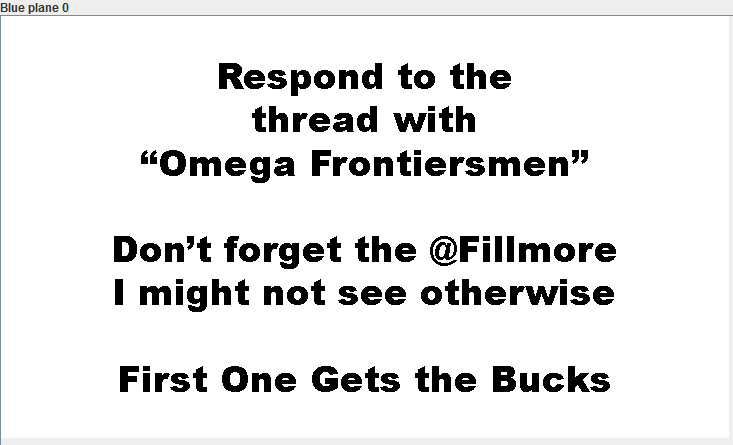 If you figure out the secret, you'll have instructions on how to claim your FillmoreBucks. So just FYI, I was told and shown what the answer is, and even after digging into the picture using Krita (Photoshop equivalent) I still was unable to find it myself. It's been almost 24 hours. I'm upping the reward to ̅4.00 now. Guys I think I got it! The picture is by Heinrich Harder whose initials are HH, but it's also the Initialism of Hansestadt Hamburg, and Hamburg is a component state of Germany! The current president of Germany is Frank-Walter Steinmeier who studied Law and Political Science at the Justus Liebig University Giessen, where Brigitte Zypries was a fellow student who's a member of the Rotary Club which has a branch in Boston, the same state of the Boston University School of Law of which Mark Kern is an alumni! It all adds up! That....Actually makes a lot of sense.